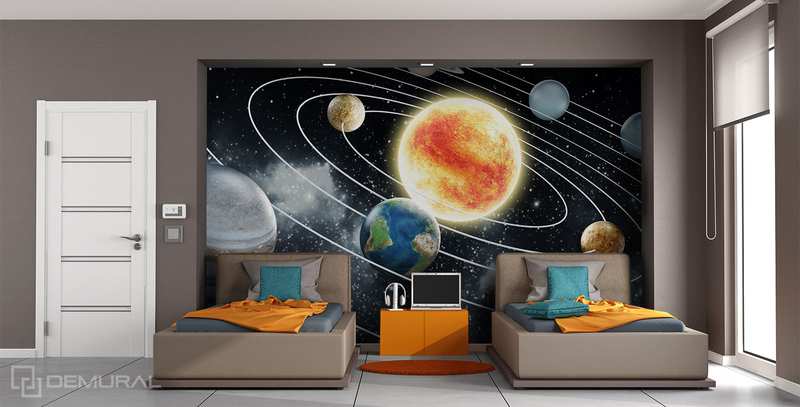 A wall decoration with a theme of a solar system will be a treat for every student fascinated by astronomy. 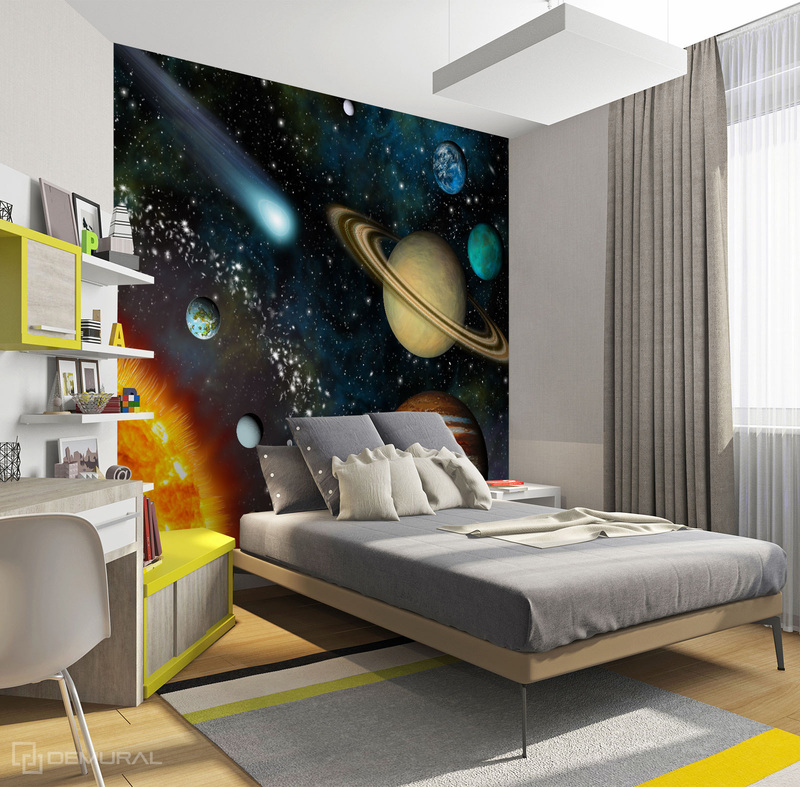 If you want to arrange your child’s room in this way, in this article you will learn how to do this in the most effective way – photo wallpaper cosmos.A child’s room must be not only aesthetic, but most of all functional. It is a space in which a child plays, rest and studies. For that reason it is worth providing the student with maximal comfort. He could do his homework and learn in a friendly atmosphere. Because in this room there must be place for a bed, wardrobe, chest of drawers, bookcase and desk with chair, their location in a usually small room is difficult. It is even more challenging, taking into consideration an ergonomic arrangement, when we add an interesting and detailed decoration on the wall. A good idea is dividing the room into a sleeping zone and the zone for studying and playing. It will let you arrange everything easier, but will also let you use the space in the room more optimally. Where should we place a theme of the solar system? The solar system is a great theme for a photo wallpaper for every love of astronomy. Such a wallpaper is usually dark, has many light points, so placing it in a child’s room may be difficult. A good solution is using it on one narrow wall that is not covered with a lot of furniture. Then it will look pleasantly and you will avoid the visual chaos inside the room. Such theme can be used as a background for a bed or a desk . 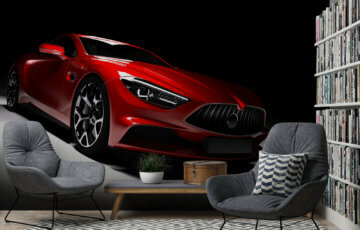 Choose small or transparent furniture that would not cover this attractive graphic. 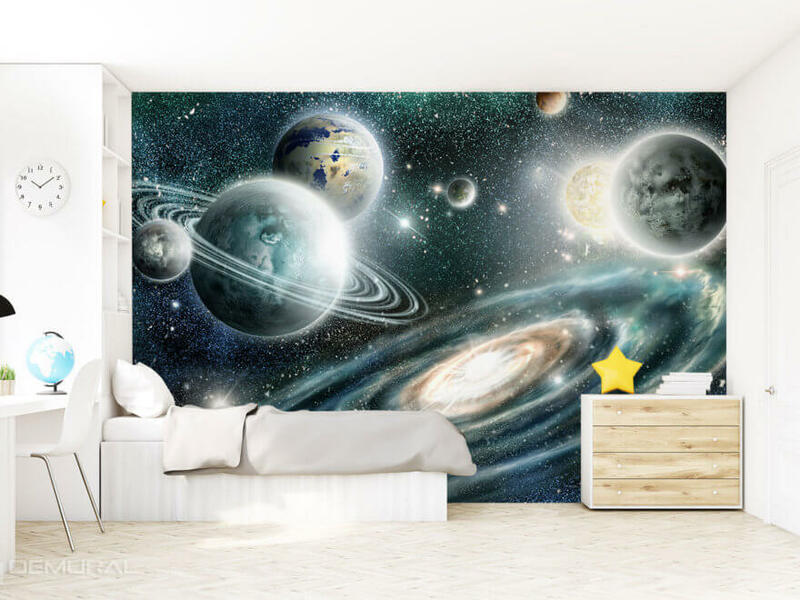 If you choose an option of covering the wall on one side of the bed, this photo wallpaper cosmos will constitute a zone of relaxation before sleeping so that a small lover of astronomy could dream of becoming an astronaut. When you choose to cover the walls behind the desk, you can combine a theme of a photo wallpaper, the solar system and studying together. In this case this wall decoration will motivate and inspire to study physics, astronomy and gsining knowledge in those fields. 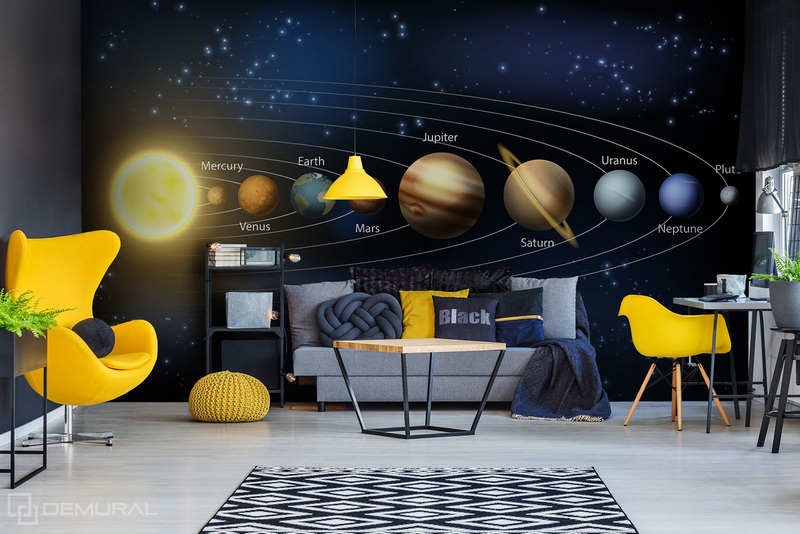 Despite the fact that the wall decoration in form of a colorful wallpaper with an image of the solar system is already a really strong decoration, you cannot forget also about complementing it with the right colour of the furniture and character of additions. First of all, you must remember about avoiding excess, so other colorful and detailed wall decoration should be left out. 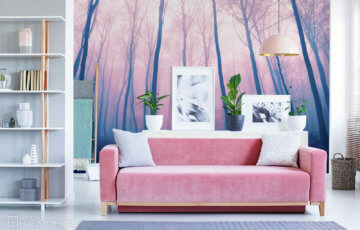 Choose rather universal furniture in toned colours that will match and complement the colours of the photo wallpaper. Additions of standing decoration are a good choice on condition that they match the main theme and there are not too many of them. A child’s room is not a museum exhibition, so the composition does not have to be completely in order that will soon be destroyed by toys and educational equipment scattered all over the room. Despite that, it is worth taking care of the style of the furniture. Colours of the walls and the number of additions to create a coherent wholeness. Such an interior will be pleasant to stay inside and it will constitute a perfect place for relaxation and studying.